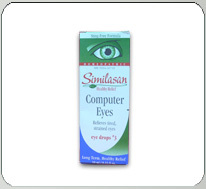 Similasan's unique "Active Response Formula" quickly stimulates the eye's natural ability to relieve eye strain due to intense computer work, TV, reading, writing or driving at night. Sting-free, no worries about chemical vasoconstrictors, rebound or contraindications. Similasan's high Swiss quality standards have provided "Healthy Relief" to millions of people for over 20 years. Directions for use: Remove tamper evident seal.-Twist cap off bottle to remove. Conium maculatum HPUS 6X , Natrium muriaticum HPUS 6X, Ruta graveolens HPUS 6X, Senega officinalis HPUS 6X.